Drum Corps leaders and chaperones at the head table of the banquet honoring the midwestern champion Boy Scout Drum and Bugle Corps at the Nakoma Country Club. 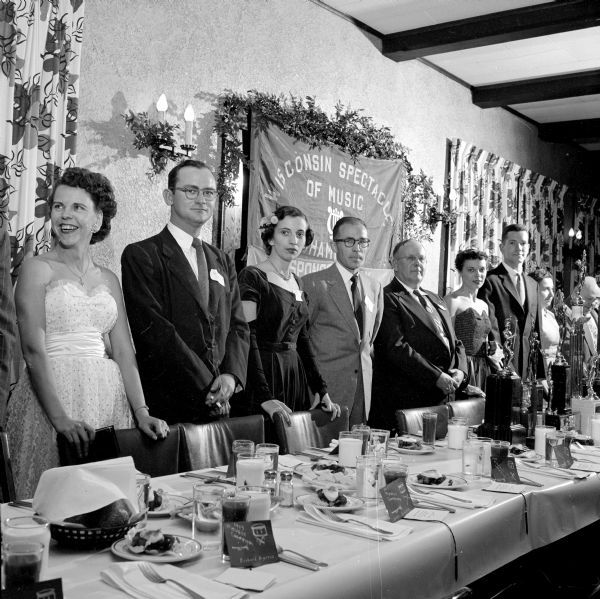 From left to right: Mrs. and Mr. Henry Johnson, Mrs. and Mr. Roger Muzzy, Clarence H. Beebe, Maryon Mesenkamp, and Stan Stitgen. The cloth banner on the wall reads, "Wisconsin Spectacle of Music." One of six images. Published in the Wisconsin State Journal November 25, 1953.